The backyard patio or deck has long been a favorite place for summer fun and cookouts, but more and more, people are discovering new ways to repurpose their outdoor space. An outdoor living room can expand the functional area of your home by taking advantage of your extra space outside. The advantages are many. Creating a living room outdoors can save energy, add living space to your home, enable people inside to be undisturbed while company is entertained outside. Lighting can set the tone for a relaxing space, just as you would indoors. Solar lights make this an easy, energy efficient choice. At least one wall can anchor your space and make it feel more like a room. Try to imagine sitting indoors at your couch, with the walls taken away. Though the wide open area might seem nice, you may feel a little exposed. For your outside living room, a wall can be anything from shrubs, bamboo screens, and an arbor with vines. Or an actual wall (such as the side of your house or garage). A weather resistant rug will define your area as a more of a room than just a corner of the yard with furniture. Nothing makes a room feel more like a room than having cover over your head. Your outdoor “roof” can be anything from the shade of a large tree, an umbrella, a retractable awning, or even a permanent structure such as a pavilion. It all depends on your budget and needs. Either way, keeping the sun and rain at bay will have an effect on what types of fabrics, building materials or electrical appliances you are able to use in your outdoor room safely. Furniture obviously belongs in your room. What type depends on how protected from the weather your furnishings will be. How they are placed is important too. The idea is to arrange your furniture in a way that people can face each other, creating a conversation area. Tables and end tables add practicality, making the room feel more complete. Like any other room inside your home, try to add the “homey” touches that compliment your design tastes. Because it is outside, try to bridge your interior décor with the outdoor surroundings. Keep the size similar to its indoor counterpart. The temptation may be to take advantage of all that space, but you will lose the intimacy of a living room. Layout your new outdoor space in such a way that it compliments your landscaping, while remaining practical. The point is to enjoy your time outside, so be aware that you may have to trim and mow around this new area. Try not to lay things out so it will make lawn maintenance more of a chore. Effective use of blinds, curtains and plants will both increase your privacy and add to the cozy intimate feeling you get from relaxing indoors. 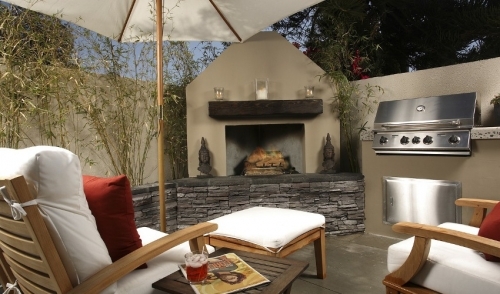 A focal point such as a fire pit, grill, fountain, or even a TV (above your outdoor bar, of course) will make the room much easier to relax and enjoy company in. As you can see, creating this space requires more than just throwing down a rug and putting your patio furniture on top. If you are planning on building a pavilion, setting up an arbor or lattice wall, putting down a patio or more to make your outdoor living room unique, stop in and ask our experts and we’ll help you do decide what materials are the best fit for your home and your budget.